The El Seibo municipality is located in the eastern part of the country. It was founded in 1506 by the conqueror of Jamaica, Juan de Esquivel, with the name of Santa Cruz de Icayagua. Towards 1518, its population disappeared and settled in Cuesta Prieta, to the east of Seibo River, where it branched off along with Soco River. The Seibo was the largest eastern province until December 31, 1944 because it was formed by the municipalities of El Seybo, Hato Mayor, Miches, Sabana de la Mar and La Romana. 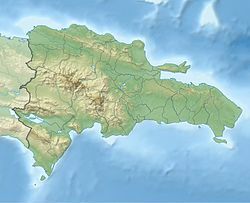 Its territory began to decrease with the creation of the La Altagracia Province, on January 1, 1945, which consisted of La Romana as the head city, the municipality of Higuey and the municipal district of San Rafael Del Yuma. Some of the distinguished people from El Seibo include Manuela Diez, mother of Juan Pablo Duarte, Cesáreo Guillermo and Alexander Woss y Gil, who were Presidents of the Republic. In addition, Monsignor Octavio A. Beras, Archbishop of Santo Domingo and Cardinal of the Catholic Church and Minerva Bernardino, who represented the country in several international events and defended women's rights, were also from Santa Cruz del Seibo, as well as world-renowned and respected tenor, Francisco (Chahin) Casanova. Also famed baseball player Cesar Jeronimo (Jr). Famous psychiatrist and public personality: Dr. Máximo Beras Goico; TV personality, actor and comedian: Freddy Beras Goico, and pop singer and TV personality Charityn Goico. El Seibo, which venerates Saint Cruz with great fervor, have celebrations to honour this saint from 1 May to 10 May. It is the only city in the country that in its supervisory celebrations organizes bullfights. Another attraction of the supervisory celebrations is the popular vigil of "atabales", a type of popular percussive music. These celebrations enjoy great popularity in all sectors of the community. Source: Síntesis de Ciudades, Pueblos e Islas del País. ^ "El Seybo Climate Normals 1961-1990". National Oceanic and Atmospheric Administration. Retrieved September 12, 2016. This page was last edited on 6 March 2017, at 12:28 (UTC).